People living in remote areas of the UK could find a new buses-on-demand scheme offers a fresh solution to the age-old dilemma of rural travel. The transport system designed at the University of Newcastle uses sophisticated computer technology to provide flexible timetables, influence bus routes and even offer door-to-door services. The pilot project in the north of England is being managed and funded by Northumberland County Council in partnership with the Transport Operations Research Group at the University of Newcastle-upon-Tyne. Early indications suggest that the Phone and Go scheme is proving a big hit with locals. 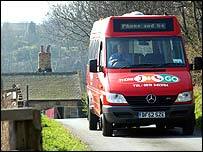 The bright red minibuses travel around the Allen valleys and the Lower Coquet areas of Northumberland, making between 20 and 65 trips every day and even servicing a daily school run. Passengers wishing to take advantage of the Phone and Go scheme need to telephone a central base in advance of their journey. Computer software checks how it fits in with previous bookings and if the dispatcher cannot offer the exact time or pick-up place, several alternatives are offered. The Travel Dispatch Centre then plots the most efficient route taking into account all the bookings and sends the information to a mini-computer on the bus using text messaging. For members of the 112-year old golf club in the picturesque coastal village of Warkworth the scheme has proved a godsend. 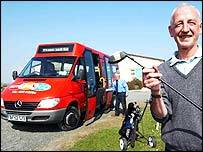 The nearest bus stop is a one-and-a-half mile uphill walk from the clubhouse. "Phone and Go is the perfect solution. Members can be picked up from home and can be dropped off on the club's doorstep," said Honorary Secretary Melvyn Rose. The next big challenge will be persuading all sections of the rural communities back to public transport, said Project leader Dr John Nelson. "So many people have become used to using their cars that a major cultural change is required," he said. "Most of our users are pensioners or mothers with children and young people but we hope all sections of the community will start to use Phone and Go within time," he said. Will future technology beat the jams?